The Rite of Christian Initiation of Adults (RCIA) is a process developed by the Catholic Church for prospective converts to Catholicism who are above the age of infant baptism. Participants are gradually introduced to aspects of Catholic beliefs and practices. It is a journey which leads many to seek full membership in our Church. Those who enter the process are expected to attend Mass on Sunday, attend a weekly RCIA session, and become increasingly more involved in parish activities. For others this journey may not lead to full membership, but will increase friendship with Jesus Christ. If you would like to talk about where you are, or if you are curious about our Church and our faith, or even if you’ve been attending Mass here and would like to find out about possibly joining the church officially, this is where to begin! All are welcome to come and see, to ask questions, and to look more deeply, with no obligation or commitment! Please fill out the form if you'd like to learn more. Scroll down the page for more interesting information! Prior to the official beginning of the RCIA process in the Fall the “Inquiry Period” takes place. During this informal time you get to ask questions or just listen to information about the catholic faith with other inquirers. There are no commitments, and coming to inquire doesn’t mean you have to join RCIA. This group is formed with others who are interested in learning more about the faith. 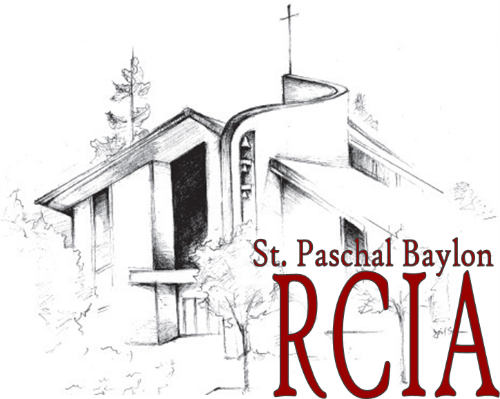 They are led by RCIA team members who are knowledgeable in the Catholic faith and understand the numerous questions you might have during this initial period. If you like what you hear and would like to join our Church, then you transition to the “Catechumenate” which is the instructional portion of the journey. While it is a time of instruction, the focus of the Catechumenate remains the overall faith formation of the person and the strengthening of friendship with Jesus Christ. A period of “Purification and Enlightenment” is the final stage before the reception of the sacrament. This period begins with the Rite of Election when the Bishop, on behalf of the Church, accepts you as a candidate for the Sacraments of Initiation at the Easter Vigil. This is a more intense spiritual time and is marked by several important Rites (ceremonies). After Easter, there is a period of coming together to reflect on the meaning of living the Christian life. It is also a time for discerning gifts and finding the most appropriate way of putting those gifts at the disposal of the community. Throughout the first year, you will meet about 6-8 times for reflection and fellowship.